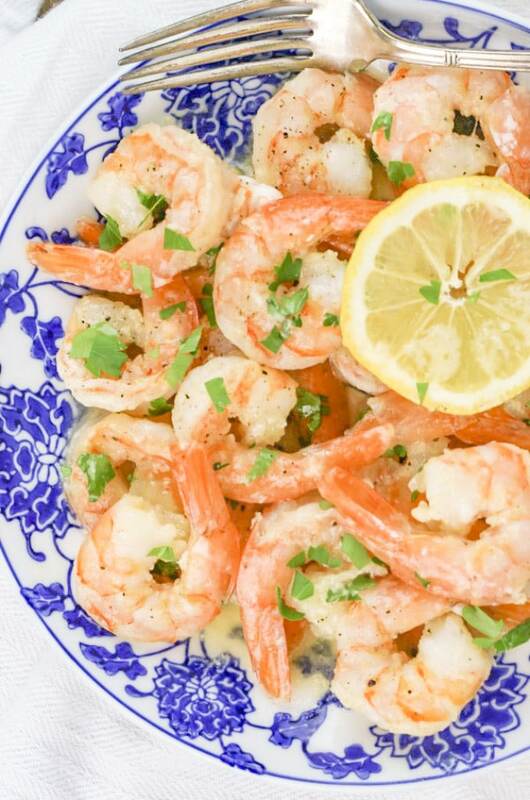 Garlic Butter Shrimp will be your new go to dinner for busy nights. This easy recipe only takes 30 minutes to make and tastes like it came from a restaurant! 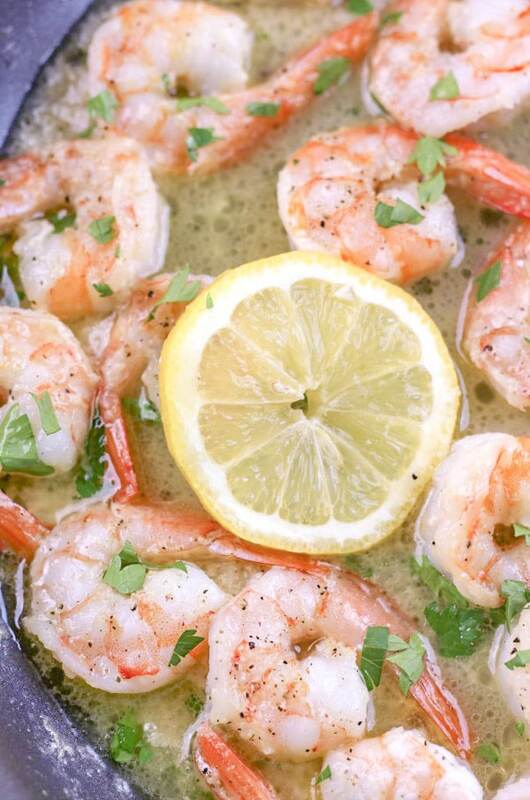 If you came here from Pinterest looking for the recipe for Garlic Butter Shrimp this is it! But with new updated and improved pictures!!! True story, before I met my husband the only way I’d ever eaten shrimp was fried. I know it’s it’s a sad, sad story. I mean how could a person not know about all the other amazing ways to enjoy shrimp? Right? Anybody else flashback to Forrest Gump when they read that? I wonder how many ways Bubba knew how to cook shrimp? 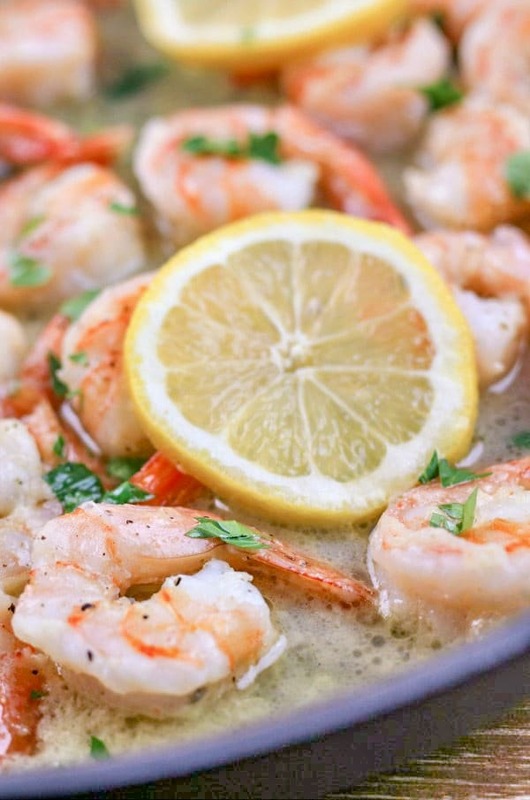 Garlic Butter Shrimp is the very first shrimp recipe I tried to make at home. We all loved it and it is one of my go to dinners for nights when time is limited or I just don’t want to cook or clean up after cooking, yuck! This is really easy and fast. I keep a couple bags of shrimp in the freezer just for this recipe. To thaw them out I just dump the shrimp a in colander and run warm water over it for a few minutes. Once the shrimp is thawed I’m ready to cook. In a large skillet melt two tablespoons of butter. Add garlic to skillet and cook for about a minute or until fragrant. Next add the shrimp to skillet and season with salt and pepper. Cook until they are pink and no longer translucent. Melt the remaining butter before adding chicken broth bring to a boil cover and reduce heat. Let the everything simmer together for five minutes. I like to squeeze a little lemon on the shrimp. Then add a little more freshly ground pepper. I think that it’s the perfect way to finish off this recipe. One of the best things about his dish is that you can serve it over pasta or rice or just on it’s own. 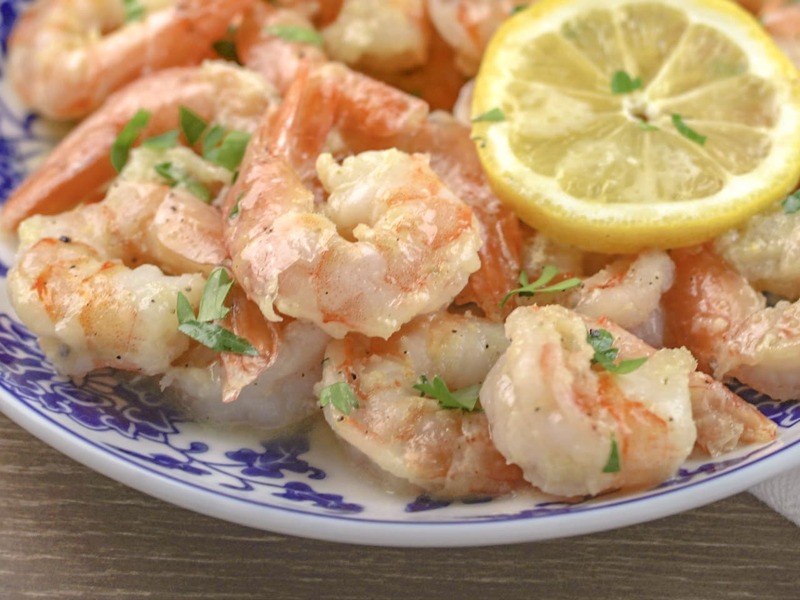 But no matter how to chose this recipe for Garlic Butter Shrimp is going to become one of your favorites. 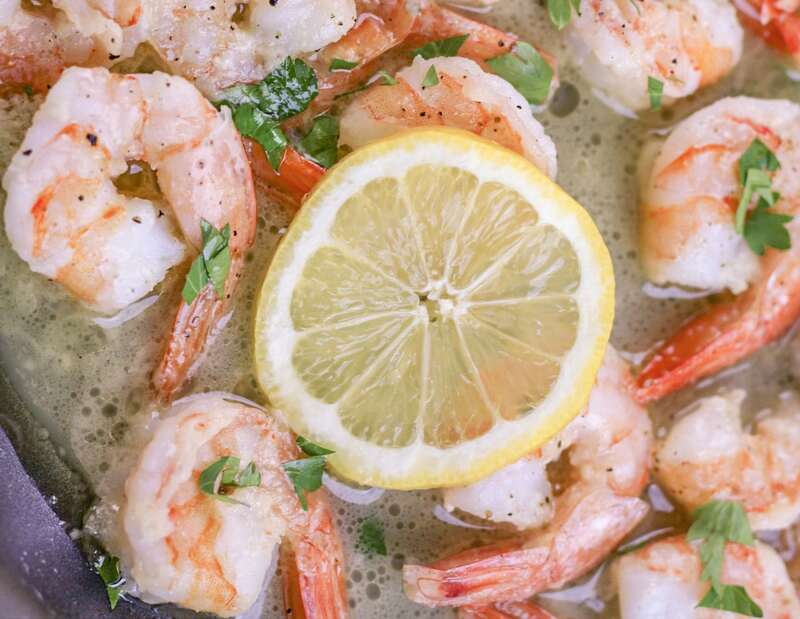 Looking for more great SHRIMP recipes? Thank you! I hope you’ll try this recipe and love it too! Yum! We love shrimp any old way, but almost never have it fried… the exact opposite of your childhood. Now I really want shrimp for dinner! Thanks so much for sharing at Throwback Thursday! A great recipe, simple and delicious! Thanks so much for sharing with Full Plate Thursday this week. Hope you are having a great day and come back to see us real soon! This is a really simple recipe but it packs so much flavor. It’s one of those recipes I make when I’m just too busy or tried to cook. 2 LBS OR 4 LBS OF SHRIMP???? To make four servings I use two pounds of shrimp. The recipe is really easy to double and could be used to make four pounds easily. Having cooked shrimp for the past 60 years, I’m guessing the amount of butter and broth reflect a single two-pound package of shrimp. For some reason it didn’t work for me. The shrimp overcooked because of all the sauce and I had to dump the sauce. Perhaps it was not what I expected. I don’t know if it would work better to grill the shrimp first, then make the sauce in the same pan, with the butter and the broth. Let it reduce, then pour it over the already grilled shimp with the garlic and some extra garlic powder. I’m so sorry that the recipe didn’t work out for you! I’m not sure what went wrong but if you decide to try the recipe again maybe cook the shrimp until they are pink and then set them aside and finish the sauce and then add the shrimp back in for a couple minutes at the end. Another suggestion would be to buy medium or large shrimp (if you didn’t already) to prevent them from cooking through too quickly. I do hope you’ll give this recipe another try and that you’ll love it!! Thanks for stopping by & Merry Christmas! OMG! How had I forgotten this recipe? When I was young, my family had a beach house. We would catch shrimp pretty much every day off our dock. After many, many nights of fried or boiled shrimp, my Mother went on a search for other ways to make things. She tried Garlic Buttered Shrimp and it quickly became my favorite. I even learned to make it in the microwave! However, over the years I forgot. Your recipe was everything I hoped it would be when I stumbled upon it. Delicious and oh so simple! Thanks for reminding me of my childhood and giving clear instructions in a super yummy recipe! This is the perfect recipe for Lent! My family can’t get enough shrimp. I made this the other weekend for our at home date night and my husband LOVED it. He loves shrimps as it is but normally grilled in the summer. This has now been added to our regular menu too.